Manifest Destiny is a musical comedy weaving together sharp satire and heartfelt storytelling into a grand adventure. Through ten original songs, the film follows gruff explorer William Clark and his naturalist companion Meriwether Lewis as they blaze a trail to the western waters. Along the way they encounter the wise Sacagawea, battle the elements, and find that President Jefferson has some surprises up his sleeve. Can Lewis & Clark work together to reach the West? In a world where destiny already seems manifest . . . what does the frontier have in store? 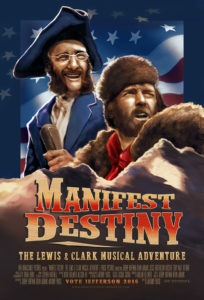 From the imagination of Jer & Kev, Manifest Destiny reinvents American history through Broadway-style songs and an expressionistic cinematic style. Anthony Parisi makes his feature film debut as director and cinematographer. Contact us for more information about this new film.